Gloucester number eight Ben Morgan could be forgiven for describing 2015 as something of a rollercoaster. He spent much of it recovering from a horrific leg injury, but against all the odds, still made England's World Cup squad, and ended the year by becoming a father for the first time. His hopes for 2016 are quite simple, to care for his son, Finn, and stay injury-free. However, there is also the small matter of making new England head coach Eddie Jones' first Six Nations squad. "As far as international rugby comes, you have to be playing well for your club and this weekend is another opportunity," Morgan told BBC Gloucestershire ahead of this weekend's meeting with Exeter Chiefs. "As far as I'm aware they are just speaking to the directors of rugby and I'm just keeping my head down and just get back into the swing of things. "If he (Eddie Jones) wants to select me that will be great but I'm happy playing here." Gloucester travel to Sandy Park on Saturday and Morgan will come up against the Exeter number eight Thomas Waldrom, who was this week voted the Premiership's forward of the month award for December. 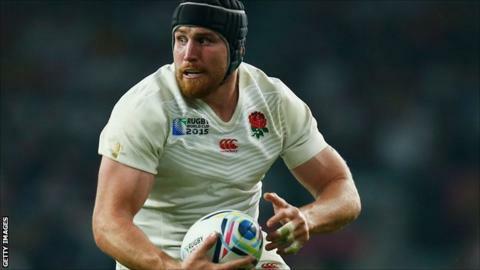 Morgan has 31 caps, while Waldrom - six years his senior at 32 - has only represented England five times, but seems to get better with age, having topped the Premiership try-scoring list last season with 16. "I always enjoy playing against good number eights and he is fine form, playing really well," said Morgan. "I'm really excited to go down there and come up against him. "We've started to come together, put some big performances in and it's a great place to go, Sandy Park, and I'm really excited to be going down there. "It'll be a big clash, we tend to have some ding dong battles down there. We need to tighten up our defence and put them under some pressure." Morgan, 26, suffered his season-ending injury against Saracens exactly a year ago on Saturday, but still managed to make England's team for the World Cup, and came off the bench against Fiji and Australia. He was given a break by Gloucester in November after an intense 11 months of rehab and subsequent appearances at the Rugby World Cup in September. "I was fortunate to get the time to refresh, it was a pretty full on year. Breaking the leg, doing the rehab, making the World Cup and then straight back into it. I feel really good and cannot wait to get stuck back in." He added: "I'm only going to improve the more time I put between myself and the injury. My body is adjusting to an alien thing being in there, a bit of metal, but I feel good and really confident with it." Morgan's wife Alice, gave birth to son Finn as 2015 drew to a close. It was, as for all new parents, a life-changing event - and Morgan is still adjusting. "It's pretty awesome, lack of sleep but it's been great," he said. "He was born on New Year's Eve. We just got home, it wasn't quiet, it was different."